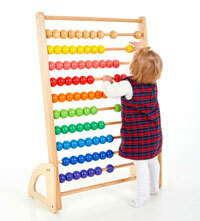 An amazing and impressive fully functional abacus with 100 giant coloured beads on a large stand. 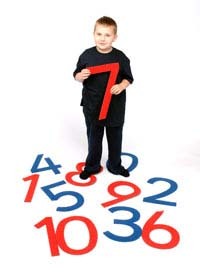 Children can learn to count, see base ten and interact with the counting, adding and sequencing process. As a piece of furniture it is simply stunning. Whilst children are using it, they are also developing their fine motor skills. Featuring 100 coloured giant beads, on a large sturdy stand. 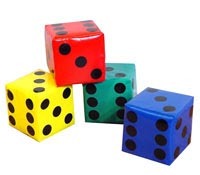 A set of 6 coated foam dice each 100mm, in 6 bright colours. 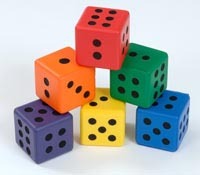 Brightly coloured dice featuring black dots from 1 to 6. Each dice 240mm.  A set of 37 soft wooden coloured numbers perfect for number learning, number sequencing and simple mathematical skills.  This set contains numbers from 1-10.  Height of each number is proportional to the respective number quantity. For example, height of number 5 is equal to the height of 5 number 1's piled up.  This is a perfect feature providing tactile and visual experiences to the children.  Children can feel 1+1=2 by physically touching the pieces or by visually comparing the heights of the pieces.  Teaching of numbers and simple mathematics cannot be easier.  Storage bag and teachers guide included.  All blocks are manufactured from EVA.  200 x 880 x 415mm. 3 stiffened felt baseboards for playing games include Draughts, Astronauts and Aliens (played as per snakes and ladders) and Holiday Ludo. (Counters not included). A new variation for the game of Hopscotch, hopping from lily pad to lily pad. Set of 8 tactile anti-slip felt lily pads and 4 coloured felt frogs, which act as counters. The classic game of Beetle using felt beetles. Parts of the beetle are inserted into the beetle frame. The set contains 4 stiffened felt beetles and one plastic dice. Printed stiffened felt baseboard with 5 noughts and 5 crosses in felt. Ideal for small hands. A great range of activities based on the famous rhyme. Printed on polyester felt . 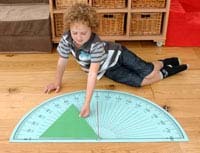 A great introduction to angles get children to place objects on top of the protractor to measure angles. Printed on rubber backed polyester felt. 31 tactile stiffened felt dominoes. Each dot pattern has a different colour, so initially players can distinguish the numbers by colour matching. Comes in a rigid plastic storage tray. A set of 16 Pound coin floor tiles, set contains 2 each of £2, £1, 50p, 20p, 10p, 5p, 2p, 1p. 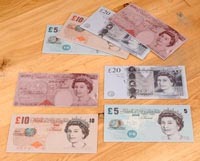 A set of 8 pound note floor tiles, set contains 2 each of £50, £20, £10, £5. 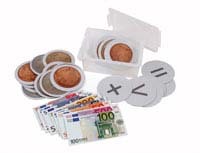 A set of 16 Euro coin floor tiles, set contains 2 each of 2, 1, 50cent, 20cent, 10cent, 5cent, 2cent, 1cent. A set of 21 large scale floor number tiles 0-20, ideal for basic number work with kinaesthetic learners. printed on 100% polyester with an anti slip backing. This fantastic ruler number line measures a whopping 2000 x 300mm. Just like classroom wooden rulers, this has 1-12 on one side and 1-30 on the other. Comes with 8 marker discs, teaching notes and photocopyable work sheets. The set all packs away into its own storage bag. Mat and discs are printed on 100% polyester with an anti slip backing. 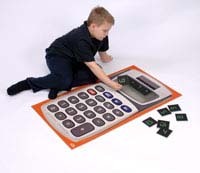 Set contains: Calculator mat 1000 x 650mm. a set of 36 number and symbol tiles. Teaching notes and photocopyable work sheets. The set packs away into its own storage bag. The mat and discs are printed on 100% polyester with an anti slip backing. 30 tactile numbers. Set contains 3 of each number 0 to 9. 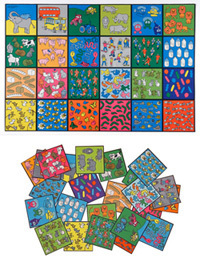 This set contains: 1 set 1-24 number tiles, 1 set counting tiles 1-24, 1 set of 30 jumbo numbers, Plastic animal counters, 4 blank tiles, Teaching notes and photocopyable work sheets, Gratnell storage box with lid. All tiles and numbers are printed on 100% polyester with an anti slip backing. A giant playmat with quantity illustrations from 1to 24, perfect for early number work. Each tile 250 x 250 mm, 24 stiffened felt squares showing quantity illustrations from 1 to 24. This brightly coloured wooden draw unit is practical and functional and will play an active part in any classroom. 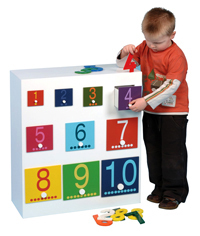 Designed with an individual drawer for each number from 1-10 to aid number recognition. 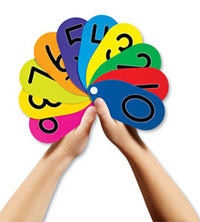  Comes with wooden cut out numbers 1-10. Encourage fun and participation with these colourful classroom tools that let children display their answers all at once while helping educators monitor childrens' progress. Fans measure 13cm L.
Groups of adorable embroidered animals guide hands-on number learning in this oversized cloth activity center. 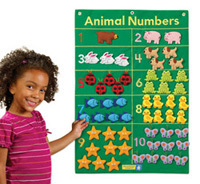 Children attach the engaging self-stick animals to the chart to practice matching numbers and sets, counting, comparing numbers, and simple addition and subtraction. PLUS, there are 10 different "species", providing young learners the opportunity to sort and classify the animals as well. Includes jumbo cloth wall chart, 55 animals, and an activity guide. 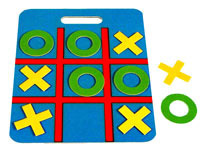 Perfect for class demonstrations and small-group play; its also a beautiful wall decoration. - Charts measure 20" x 27". - Grommets for easy display. - Color-coded animals and numbers provide visual clues. - Small parts. Not suitable for under 3 years. 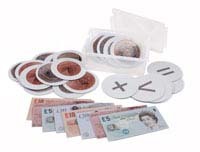 A bumper pack of 16 Pound coin and 8 Pound note floor tiles, 8 operator tiles all stored in a Gratnell's tray with lid. 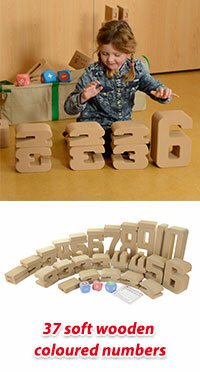  Introduce numbers with these 10 big wooden number boards. 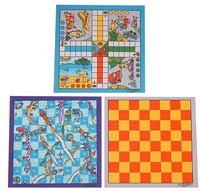  Each board has a clear view plastic top with a metal ball sealed inside.  Use the permanently attached magnetic pen to guide the ball along the lines and curves of each number.  Strengthen early number skills during sand play activities.  These unique shells, printed with numbers 1-20 are a fun way to reinforce early math concepts. 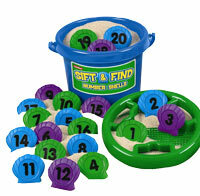  Includes 20 plastic shells, storage bucket with sieve lid and teachers guide.